Have an opinion about farm management practices? Want to challenge yourself and learn with your peers while having fun with them? Then you will want to participate in the Badger Dairy Challenge. This is a competition that involves students analyzing a commercial farm and presenting their observations and management recommendations to a panel of five industry professionals. The Dairy Challenge contest is an unmatched opportunity to apply the knowledge you’ve gained from your core course work, labs and internship opportunities in a real-world setting. This is also an excellent opportunity to network and learn from industry professionals. Each person who participates in the contest will get a conference note pad holder for their involvement. Students can form their own teams or enter individually to be placed on a team. To allow students to apply their dairy management skills learned at the University of Wisconsin-Madison in an applied practical setting. A maximum of seven teams can participate in either of the contest’s two divisions. The Legends Division will be made up of students with senior standing or any students who have successfully completed Dairy Science 433, Dairy Herd Management. The Leaders Division is open for all other undergraduates or second year Farm and Industry Short Course students. 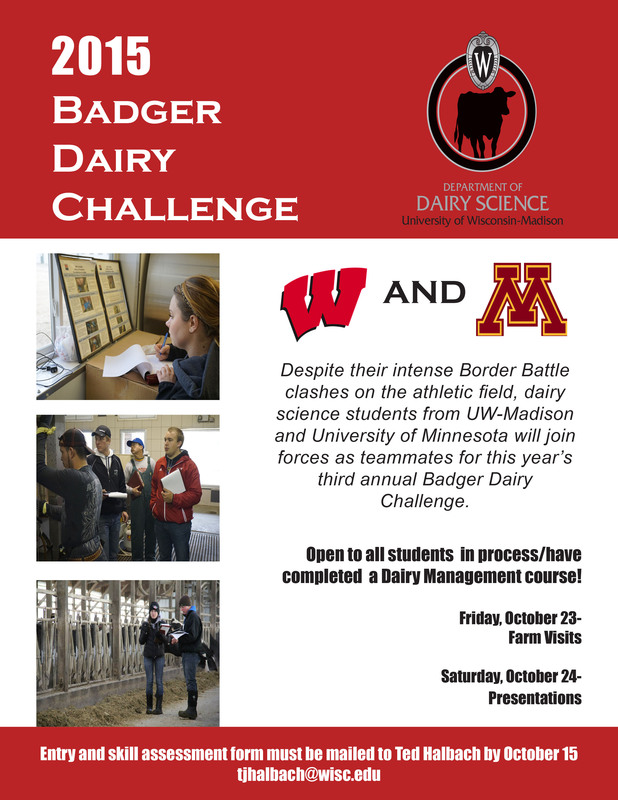 In order to be eligible to participate in the Badger Dairy Challenge, a student must be a full-time undergraduate student or in their second year of Farm and Industry Short Course. Teams will consist of four members. Students can select the members of their team, or if a student does not have a team preference, the contest coordinator can randomly place the student. The Dairy Challenge staff reserves the right to compose teams of five if the limit of participants is exceeded in either division. For additional information, contact Ted Halbach at tjhalbach@wisc.edu or 608.219.5289.